What is the difference between a home inspector vs. a mold inspector, and how can each one benefit you? As a retired building inspector and a practicing mold inspector for the past 8 years, I can say with confidence that being proficient at both home and mold inspections at the same time very difficult. It takes a considerable investment in time and training – which makes the task unrealistic for most people. In addition, I’ve learned that it is much better to hire a specialist when it comes to mold, water damage, condensation issues, leaks, floods or whenever you see mold. If you are looking to get answers on the overall condition of a property prior to making a home purchase, then you should hire a home inspector. Home inspectors are not required to comment on mold or other environmental concerns, even though they do so from time to time. Further, many home inspectors are reluctant to report or document suspected mold concerns because it actually exceeds their scope of work/standards of practice, while exposing them to unnecessary litigation – a part of the job that home inspectors desperately work hard to avoid. So What Do Home Inspectors Actually Do? Essentially, a home inspector will be hired to check the systems and components of a property according to a scope of work or standards of practice. Although all systems and components of a home are important, I wanted to highlight a few issues, along with some photos for better clarification. 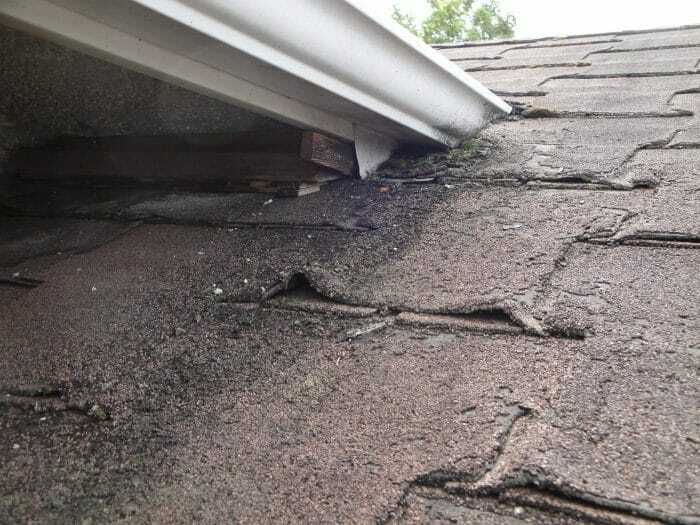 The photo below is an example of a serious settlement issue, that may have an impact on the structure of the home. The home buyer will need to know about this as the issue may involve the expertise of an engineer. The engineer will explain any future implications and/or extra costs to consider prior to buying the home. This second photo shows an older, expired roof, which the potential home buyer will want to know about. In this case, the roof will need to be replaced in short order, to prevent expensive repair costs linked to water damage and possible mold contamination. What Are the Training Requirements Of A Home Inspector? There are a number of steps that home inspectors must go through which involves both theoretical and practical knowledge. Holding a membership with an association such as HIABC, is, in my opinion is the best possible advantage you can give yourself. According to the HIABC, home inspectors must be able to prove that they have completed at least 150 hours of Home Inspection Training from an accredited post secondary education. Home inspectors must be licensed by Consumer Protection BC. The requirements for membership, training, certification etc. depends on where you live. What Makes a Great Home Inspector? There are many answers to this question, however, as someone with almost a decade of experience in the field, I have listed some considerations to think about before you hire your home inspector. 1) Your home inspector will allow you to accompany him/her during the inspection. This is important because you want to be able to learn from the inspector and ask relevant questions as they come up. Many home inspectors will disagree with me on this because they can easily explain the findings during their summary, after the inspection. This approach is fine too, but in my humble opinion, I believe the client will benefit greatly from quietly shadowing the inspector. Regardless, as the client you must be respectful… allow the home inspector to do his/her job without too much distraction and follow the lead. Inspecting homes is not easy, as there are a host of different systems and components to inspect and report on. 2) They communicate clearly. Great inspectors will be concise with their explanations, yet use simple everyday language without too much jargon. They need to make sure that you understand all of the details presented during the inspection, along with the impact that each issue may have on your buying decision. 3) Your super star home inspector will be open and available to taking phone calls after the inspection. Everyone processes information differently, so you may need guidance, especially if you are not clear on something the inspector has written in the report. Even better, yet rare, it is nice when your home inspector takes the time to follow up with you after completing the inspection to ensure that all of questions are answered to your satisfaction, so that you feel good about the whole experience. 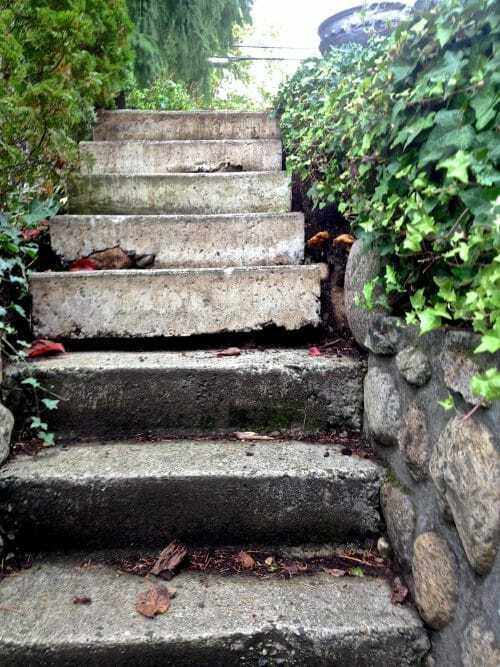 4) Your home inspector will provide a detailed written report including a number of supportive photos. The home inspection report should clearly emphasize what the home inspector has explained to you during the inspection. There are specific requirements that need to be included with every home inspection report as outlined by Consumer Protection BC. 5) Your home inspector will be licensed, insured (which is legally required) and ideally belong to a professional association such as HIABC. When a home inspector is a member of a professional association you will have comfort in knowing that your home inspector is dedicated to ongoing training for the betterment of the profession and the public they serve. 6) Your home inspector should have a great reputation. These days, it is easier than it used to be to find a professional. Friends, family and online review sites should point to the home inspector of choice. You want all the stars aligned here. With a few clicks or by tapping your phone, you’ll have some great information to help you make a decision. The best home inspectors have figured out that online reviews are necessary when it comes to understanding how people nowadays make buying decisions. Google, HomeStars and Yelp, are a few places (locally based in the Vancouver area) to research the best. 7) A home inspector with the “X factor”. You want to find someone who truly cares about protecting you, while providing the best value for your dollar through exceptional service. This will be apparent when you have a conversation on the phone, prior to booking the inspection. At the same time, you should expect to pay a fair price for service and professional competence that goes above and beyond a standard home inspection. For this reason it is a good idea to find a home inspector when you are looking for a home to buy, rather than scrambling for one once you have made an offer. The takeaway… Anyone can take the proper training to be a competent inspector. With home inspectors, as any other service provider, you normally get what you pay for. Character, honesty & common sense (which cannot be taught in any classroom) are the key personality traits that will put any inspector to the test when it counts the most. What Do Mold Inspectors Do? Now that you have a better idea about what home inspectors do, and what to look for as you seek the unicorn of home inspectors, it's time to talk about mold inspectors. The mold industry is not regulated in the same way as the home inspection industry, which means it is even more important to choose wisely when you are looking for a mold inspector. One major difference between a mold inspector and home inspector is the fact that a home inspector cannot legally fix or repair any of the issues found during a home inspection. By contrast, mold removal companies can perform mold inspections, remove mold, test for mold and restore homes until they are safe to occupy. Some would call this a conflict of interest. In reality though, most mold remediation or restoration companies (those who remove mold) typically do not want to perform mold inspections. They would rather focus their efforts on removing mold and cleaning the home and contents than perform mold inspections. There is simply more money to be made on that end. This is why mold remediation and restoration companies routinely take indoor air samples rather than perform thorough inspections. As a point of reference, indoor air quality testing takes about 20-30 minutes, in comparison to the 1.5 to 2 hours it takes to do a mold inspection. 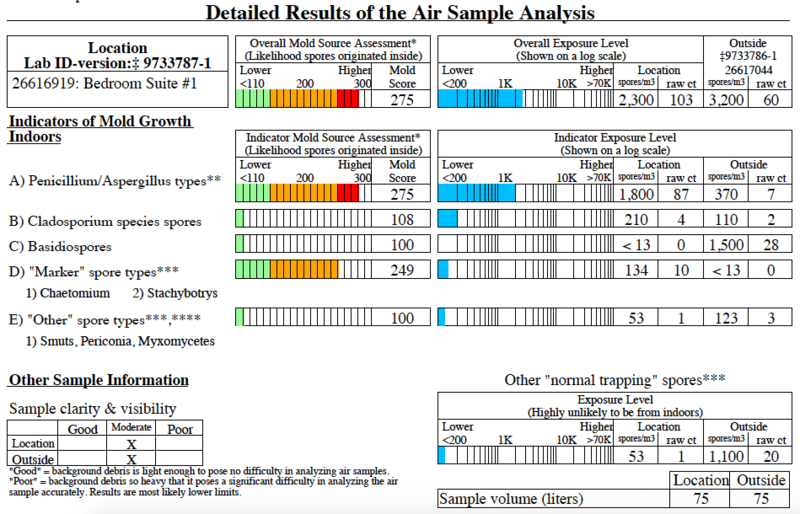 The photo below reveals a snapshot of an indoor air quality test for mold. You can see that it shows a comparison of the air quality outside to inside the home, the types of mold and most importantly the extremely high MoldScore (in red). If the lab report (from the indoor air quality testing) says that the indoor air quality of the home is contaminated with mold, now they can justify opening up walls, floors and ceilings to find the source of a mold problem and remove it. However, calling in a competent mold inspector to perform a thorough investigation first will save time for the remediation/restoration company and money for the homeowner. It is the job of the mold inspector to determine as much as possible where the source(s) of the mold is and provide recommendations for how to properly deal with it. Often, mold remediation companies will not even come out to a property unless they know for a fact that visible mold is present or there is a current flood or leak that needs to be contained. Although the mold industry is not regulated in the same way as the home inspection industry, there are governing bodies that set standards for which mold inspectors and remediation/restoration companies should abide by to best serve their clients. One such organization is the IICRC. (Institute of Inspection Cleaning and Restoration Certification) Inspectors and remediation/restoration contractors who have this certification uphold a high standard. 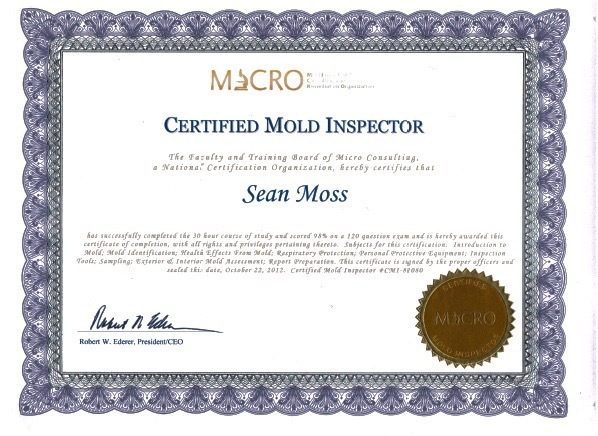 When looking to hire a mold inspector, you should be looking for a mold inspector who has earned a certification from a recognized and accredited institution. Also, it’s best to hire a mold inspector who performs inspections full time rather than a part time handyman without the proper training or adequate experience. To save money, many people hire a “jack of all trades” guy to deal with the mold. The “Jack of all trades” may have experience with construction projects, but not necessary mold removal, so it is best to find out. Hiring an unqualified person for a mold inspection or removal project can be a dangerous mistake, especially when a mold job requires proper containment of the infected area to prevent further mold contamination throughout the home. When the “jack of all trades” guy lacks the necessary training with mold, he may unknowingly allow the mold spores to migrate freely throughout the home, while exposing people to potentially toxic mold. Fortunately there are several training resources for people to gain their certification as a mold inspector. In my opinion, you want to hire a mold inspector who has at least 5 years experience in the field. You also want someone who is certified as a mold inspector by a reputable institution such as MICRO. This company offers excellent training and resources for mold. In the photo below I have included an example of a mold inspector certificate. Preventing mold from growing in different areas of the home. Identifying the most common health hazards associated to mold exposure. Understanding how to properly contain mold once it has been discovered. Knowing the most common mold species that occur inside the home. Understanding the different methodologies for removing mold. Knowing what machines and equipment are most effective and relevant to solving a given mold issue. Using PPE (Personal Protective Equipment) required for mold inspections. Testing for mold and interpreting the lab results. Knowing when to call in a remediation and/or restoration contractor. Using tools such as moisture meters and infrared cameras, hygro-thermometers, air testing equipment, powerful flashlights, ladders, etc. Understanding how mold affects different building materials. Advising the client when and how to deal with a DIY mold problem rather than calling in a remediation or restoration company. However, in reality, most mold inspectors typically do not have the adequate training for some of the proficiencies listed above, including remediation or restoration. The majority of mold inspectors only deal with inspecting and testing for mold. As with any profession, the more training and experience your mold inspector has the better, which is why I believe in understanding as much as possible when it comes to the initial inspection to removal and restoring a home to a safe living environment.